PARIS - A "yellow vest" demonstrator lost his hand during clashes with police outside the main parliament building in Paris on Saturday, witnesses told AFP, during a 13th weekend of anti-government protests across France. 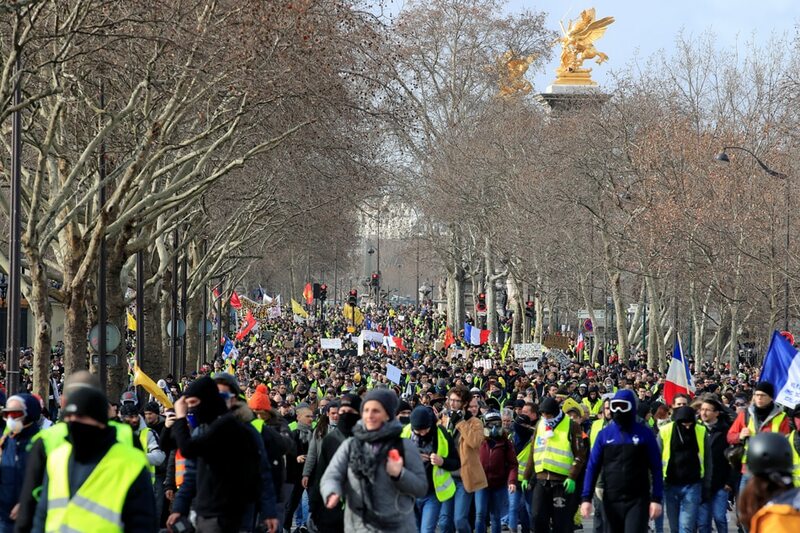 Clashes broke out outside the National Assembly building in Paris after a march from the Champs Elysees arrived there. As the march continued, vandals burned rubbish bins as well as cars -- mainly luxury models -- vandalizing bus shelters, cash machines and shop windows along the route. One of the torched cars belonged to Sentinelle, France's anti-terrorism unit. Interior Minister Christophe Castaner expressed his "indignation and disgust" in a tweet. Volunteer medics at the National Assembly told AFP that a man had had his hand ripped off during the clashes between police and protesters. One witness who filmed the incident, 21-year-old Cyprien Royer, said the injury had been caused by a flash-ball grenade fired by police. Royer said the victim was a yellow jacket photographer taking pictures of people trying to break down the barriers protecting the entrance to the National Assembly. "When the cops went to disperse people, he got hit by a flash-ball grenade in the calf. He wanted to bat it away so it didn't explode by his leg -- and it went off when he touched it," he added. By early evening, officers in Paris said they had arrested 36 people and 16 were being held in custody, they added. "We mustn't give up," said pensioner Serge Mairesse, from Aubervilliers, just outside Paris. This was the 11th time he had marched with the movement, he told AFP. "We have to win to have more social and fiscal justice in this country," said Mairesse, who was carrying a placard calling for the reimposition of a wealth tax on high earners repealed by Macron. At the march in the southeast city of Lyon, Benard, a 56-year-old computer technician expressed skepticism about Macron's "great debate" initiative designed to address people's grievances. "It's all very good, the great debate, but we want something concrete: fewer taxes, more purchasing power. We'll be here every Saturday of the year if we have to." Thousands of protesters turned out Saturday in the French Mediterranean ports of Marseille and Montpellier and also in Bordeaux and Toulouse in the southwest -- strongholds of the movements -- as well as several cities in the north and west of France. But last week's official estimates were disputed both by march organizers and contradicted by an independent estimate carried out for news media, which gave a higher estimate. French prosecutors are meanwhile investigating a series of attacks on homes belonging to politicians in Macron's Republic on the Move party, ranging from vandalism to arson.